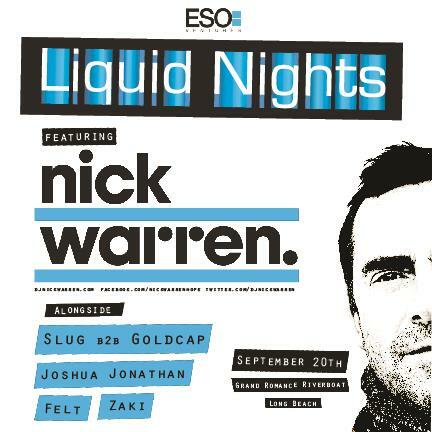 Liquid Nights w/ Nick Warren! This will be our 3rd and final boat party of 2013. We are so excited to have the opportunity to be hosting one of the all time greats. What a way to end the summer! We would like to invite you to join us as we board the Grand Romance Riverboat in Long Beach for a very special summer-end event. Nick Warren will be our featured guest. We have been working hard over the past 3 years to bring you talented underground djs and producers. Our goal with these boat parties is to provide people of the greater Los Angeles area with an event outside of the norm. Who needs Miami? We can produce and be known for throwing some amazing boat parties as well. Nick Warren's impressive career has seen him release the very first "Back to Mine" album, a staggering eight albums for "Global Underground", and one for "Renaissance" and "Cream". He is also in control of A&R for record label Hope Recordings, as well as being a member of the highly acclaimed duo Way Out West. Starting as tour DJ with Massive Attack, moving onto a residency at super club Cream and playing at every self-respecting club on the planet, has led him to this natural position as one of the world's most respected DJs. All this history has been eclipsed by Nick’s present: Nick continues to DJ every weekend all over the globe, whilst also maintaining Hope Recording's high quality output in his role as head of A&R. Nick’s DJ career spans two decades and is driven by a continual desire to evolve and change while searching out the new cutting edge producers from all corners of the world, in many cases long before they become established. This is no better represented than in the continuing bi-monthly radio show "Soundgarden" on Friskyradio which attracts over 150,000 unique tune-ins to each airing and his Delta FM show in Argentina. He is also a regular contributor for John Digweed’s "Transitions" show. You can understand why we are truly blessed and excited to have him join us! Tickets for this event can be purchased at Flavorus (www.flavorus.com/liquidnightsnickwarren) and Resident Advisor (www.residentadvisor.net/event.aspx?512009). Be advised, this event has a limited capacity. Most tickets will be sold online. We will be keeping everyone informed on tickets remaining as the event draws near. Our good friends at Beats & Pieces will be providing art displays for you to view while we sail. There will also be live paintings during this event as well. The boat leaves at 10:30pm so please don't be late!